Dinky originated in Belgium, she is a 2002 Introduction and the receiver of many awards including Gold Medal, Baden-Baden 2003, Gold Medal, Le Roeulx, 2003, and Gold Medal, Lyon, 2005 . From 2003 Dogwood produces large single petal blooms w/ the stamens high lighted against the white background. Awarded Silver Certificate, ARS Trial Grounds, 2007. 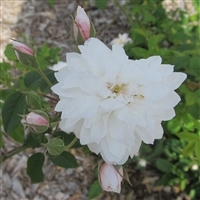 Before 1835 this variety offers a light sweet fragrance with clusters of flowers. Thornless or nearly so this plant has vigorous growth. A German introduction in 1934 this variety makes large sprays of flowers and is very generous with flowers. A wonderful shrub. Can be used to form a hedge. The photo of the vase is a single spray. Sometime before 1850, this is very unique. The flowers will last a very long time and are a great companion in arrangements. From the Netherlands in 1919 this plant is generous with its blooms, forming in large clusters. Introduced from France in 1879, this plant has larger blooms than many Noisettes. It is a good selection to cover an arbor. Discovered by Dr. Malcolm Manners in 1997, this is a sport of Smith's Parish. The flower can be all red, variations of pink to red and even a white streak. The colors are darker in cooler weather. This makes a fine hedge plant. Rosette Delizy is from France in 1922. This flower generally has a high yellow center framed by carmine colored outer petals. This was the Setzer family rose from the 1800's. The blooms have a strong musk fragrance. 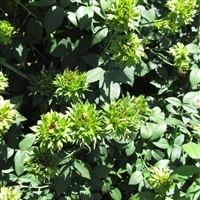 It is of vigorous, healthy, growth and may be used as a climber. A sport of Souv.de la Malmaison, although from the early 1900's in Ireland, it was not introduced until 1950. Flowers in clusters against dark green leaves. St. David's is a Bermuda Mystery Rose found on the Bermuda island it is named for. Very quick to branch off, making a very full bush. Very generous with the number of blooms. 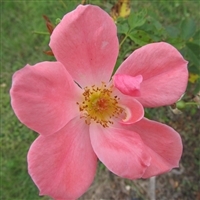 A Buck rose from 1975 this produces large flowers up to 4" in diameter, blooms in clusters with a spicy clove fragrance. Winner of 4 awards this rose is from 1954, very fragrant and loves to bloom. It will make cut flowers for those that like to brings their blooms inside. A Bermuda Mystery Rose, this variety was found growing in the grounds of the Holy Trinity Church in Bailey's bay, Bermuda. Also known as "Bermuda Trinity". A Bermuda Found Rose. This variety has upright growth and is very generous, blooming continually. 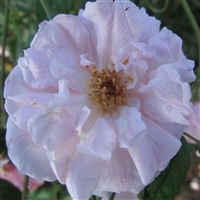 It won the Victorian award at the 1999 Charlotte Rose Society Show.